Can internal features be viewed in a 3D human eye model? All 3D human eye model types are designed to allow students, patients and researchers to look into the human eye. The cross-sectional models or the full eye that opens to reveal inner structures are perfect for both external and internal structure identification. Using the anatomical model with students and patients is an ideal way to allow them to see just what internal damage has occurred in the eye and why specific symptoms or types of vision loss occurs. Patients and students will both find that having a model to exam during presentation of the information helps to clarify and enhance understanding in a very natural and organized fashion. All the internal features should also be found on a corresponding information card that is kept with the model. This card can be used to provide the medical names for structures in the eye as well as to provide additional information on a variety of eye conditions. I want to show students a variety of different conditions of the eye that include the lens and cornea. Are there models available that provide this information? There are four separate 3D human eye model options that feature a removable lens and corneas. The first two models are the basic and full eye model. These models have a healthy or normally shaped lens and cornea and are great for any type of basic anatomy class or medical study class. 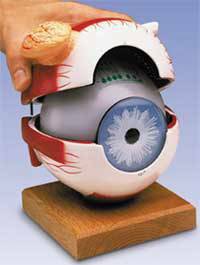 The second two models include the cornea eye cross-section and the cataract eye. The cornea eye cross-section features four interchangeable corneas and corresponding information card. The card provides further information the result of the cornea malformation and how it impacts on vision and eye function. The cataract eye model has five interchange corneas that will help students understand the vision restriction that commonly occurs with cataracts of different degrees and types. The information card with this 3D human eye model highlights the damage to the cataract and specific conditions that may occur in vision or ongoing eyesight degeneration and possible permanent loss. What is the best basic 3D human eye model for a classroom or lab setting? Individuals that have the responsibility of ordering supplies and equipment for educational institutions have to be concerned with staying in budget as well as in buying high quality equipment. Buying directly from an anatomy model manufacturer typically is the best option since you are assured a high quality product that is developed to be accurate, durable and practical as well. The basic 3D human eye model is no different that any other model. There are two models that are great for general study and they include longitudinal section model as well as a full eye model. They will both provide the same detail an information however the full eye model can be split open to reveal the interior structure while the longitudinal model will already display those structures. Both model options come with a removable lens and cornea and both are designed to be highly accurate in the depiction of the internal and external features of the eye.